Home » Featured Flag » Waste not, Want not! Today was a retreat day – a day of doing things that really don’t require a lot of thought. My sister arrived on January 8 and my routines immediately went for naught! Blog time, journal time, ‘me’ time disappeared into a daily round of trying to find new things to do in very cold and often stormy weather. We did manage a trip to Lake Louise for lunch on the only sunny day! She has now returned home, so life is gradually moving back to ‘normal’. Today I re-entered my ‘studio’ – my oh-so-tidy studio of two weeks ago – and undertook to lay away all the items that have been deposited there since my last post. During this process I got sidetracked and decided to do ‘something’ with my bin of batting scraps. The lid kept popping off! Each of my journal quilts requires a thirteen inch square of batting and I’m also working on the ‘Re’ series of ‘recycle’ pieces, so this effort supported both projects! Having spent my early childhood in a farm home where ‘making ends meet’ was a daily concern for my Mother and with a Grandmother, who had lived through the depression in another part of the house, I’ve always been a recycler and fairly frugal with supplies. In fact I get great satisfaction from making maximum use of ‘every’ resource available to me. Remember my “Use it or lose it” mantra during the downsizing from large home to motor home? When it came to art supplies, I decided ‘Use it’ was the only possibility! 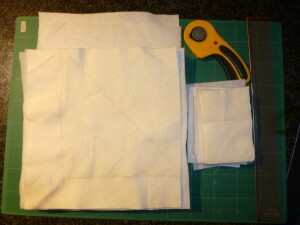 I now have 14 batting pieces ‘pieced’ and ready for use in journal quilts or other projects of like size – all prepared from ‘scraps’ that I came close to sending to the land fill! 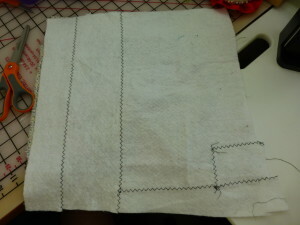 Think of it, 14 square feet of batting – actually a little more as this will be the finished journal quilt size. Why? Because it gives me satisfaction to know that this batting won’t go into the garbage and because I needed a mindless task today. In addition, there are two larger pieces that will find their way into other art quilts and a number of pieces that will work well for making some fabric post cards. The process is simple. 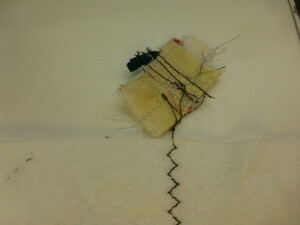 After making sure that the edges to be joined were straight, they were stitched together with a zigzag stitch. 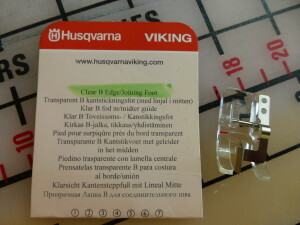 There is a little trick that made the stitching simpler – a joiner foot for my sewing machine guides the fabric piece in a parallel track and takes a lot of the hassle out of the stitching. Another little trick that I use a lot – when stitching in series, I stitch onto a scrap of material so that I can remove the piece just stitched and join it to another piece immediately – it speeds up the process. Was the effort worth it? I think so. What do you think? Comments can be posted here or to DianeDuncanArt on Facebook.